The new section of Broadalbin Street downtown on Monday afternoon. Getting new “wayfinding” signs for downtown Albany has been a long process now nearing its end. It’s taken about six years, and the bills for having 27 signs designed, made and finally installed will end up totaling around $140,000. The sign idea originated with a downtown refinement plan by the Portland firm of Crandall Arambula in 2011. Some time later the advisory board of CARA, the Central Albany Revitalization Area, followed up and set aside $75,000 for signs that would draw attention to downtown and help visitors find their way around. It wasn’t until 2015 that the project took a step forward with a Portland designer’s presentation of what the signs would look like. His contract was for about $15,000. A couple of years later, in September 2017, CARA awarded a $100,209 contract to have 27 signs made. 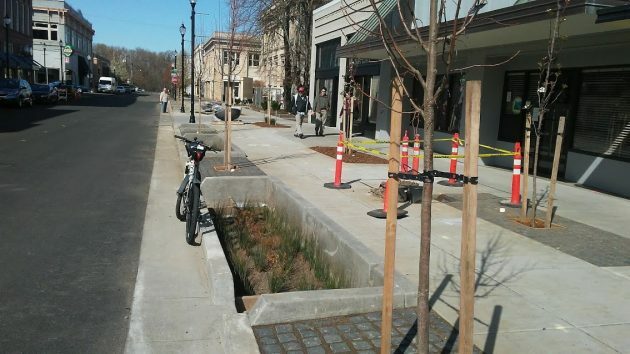 When it meets at 5:15 Wednesday afternoon (March 21) at City Hall, the CARA board will face a request for an additional $26,605 to cover the likely cost of installing 20 of the items, described as “pedestrian signs.” The city got a quote of $25,338 from Eugene Sign & Awning but is soliciting competing bids as well. The quoted price is based on “prevailing wage rates,” a report to CARA says. Besides the 20 pedestrian signs, there are seven bigger ones intended to be seen from vehicles. Those are still being made. When they’re ready to be installed, probably by late April, the city will either get quotes for the installation or have city workers do the job. Love the gentle sarcasm in your last paragraph. You might find that the mayor labels you as negative. I’m on her permanent “you-know-what” list for that infraction. Thanks for the story, Hasso. Otherwise, we would be in the dark, stumbling around with the tourists downtown. Not stumbling in the dark, what with fancy new, ugly lighting. Do I detect a little gentle sarcasm in your last paragraph? I like the article. Thanks. I’ll look for the signs. It’s hard to distinguish voice inflection on a written blog, but I’ll interpret the last sentence as sarcasm. Enough w/ Downtown, what about the rest of the town (that acually makes the town) lets spend a little on the other areas for improvements.Tax Payers would appriciate it .It has happened before when you fix Downtown and shortly after it turns back to a Ghosttown. Share the Wealth Mayor! $5,000 dollars a sign. Only in government ! Just like the overhead lights….wasting your hard earned money. It does seem way overpriced. Just like any business advertising, effective signs must catch peoples eye. The have to be clear, attractive and helpful for people to find their way. Every sign is unique. It’s not like ordering 5 standard handicapped signs for a parking lot. Every sign in each location will probably point to two or more different attractions, and those directions and content will differ at every location a sign is placed. They will probably also be designed so that they can be added to or changed as downtown changes. And they have to be made well enough to last for 20 years or so. The signs are placed out to bid, and the lowest responsive bidder usually gets the work, so the free market determines the price. Signs are a commodity, and every business, church, school, fraternal lodge etc. has their own. Unless you have personal experience in purchasing similar signs, I don’t see how you can easily determine whether the cost is appropriate. But again, it went out to bid, so if they’re really more expensive than they should be, your anger should be directed to the businesses that charged outrageous costs. I tend to agree about cost (undecided about justification), if the bidding process was fair and honest, about which I don’t know enough to judge, being a bit jaded from growning up in a cesspool of corruption far from here. We’ll see about cost-effectiveness when some of the signs need to be replaced due to vandalism, etc. If it isn’t a quick and cheap re-make from existing patterns, then the whole thing will have been a bust.